Ok, so as we mentioned before this recipe requires a ton of patience. However, if done right, the payoff is huge! Prepare the short ribs. Place the short ribs on a large jelly roll pan and season generously with salt and pepper, making sure to coat all sides. Heat a large Dutch oven (7 to 8 quart pan) over high heat, and add enough olive oil to coat the bottom. Once the oil is hot, sear the short ribs on all sides, in batches. Don’t rush this part, and overcrowd the pan – this is where you build the flavor of the short ribs. Transfer the browned ribs to the jelly roll pan and repeat with the remaining ribs. Preheat the oven to 325 degrees. Once all the ribs have been browned and removed from the pot, turn the heat down to medium-high heat. Remove the excess oil and fat and leave about 1 tablespoon remaining in the pot. Add the onions, and season with salt and pepper and cook until translucent and slightly browned – about 10 minutes. Add the smashed garlic cloves and saute for a couple more minutes. Add the tomato paste, and cook for a few minutes, until thickened. Add the balsamic vinegar, Worcestershire sauce, and beer, making sure to scrape any bits stuck to the bottom of the pan. Return the browned ribs to the pan. Add enough beef stock to cover the ribs and bring the liquid to a simmer, then remove from heat. Cover with pot with aluminum foil and then cover with the lid. Bake for 3 hours or until the meat can easily be pierced with a knife or pieces can be torn back with a fork. Remove from oven and let the ribs rest for 15 minutes, uncovered. If needed, skim off the fat off the top. The first time I made this I think the tomato paste was included, but after thinking it over I don’t really think it was missed. You can’t go wrong either way, but we didn’t feel like it was needed. Instead of 1/2 cup of Balsamic, we use 3/4 cup. This really helps cut the richness and give the short ribs a little pop. Beer…..I know, I know, why, oh why would you change anything involving beer? So, as it turns out, not everyone loves the all the flavor it provides. So, if you are in that camp you can do a couple of things. First, increase the kind of broth you are using to make sure your measurements are still accurate. You can also add more balsamic if you wanted, as we do. You could, if you really wanted to, add a little wine in there as well. It would really help fortify some of the flavors you are trying to develop. IF you do use wine, make sure it is wine you would drink normally, because it will only intensify the flavors. So, if you won’t drink it, don’t use it to cook with. Finally, we usually skip the parsnip puree because we just don’t have it around. The great thing is you can use almost anything in it’s place. For example, good substitutions include mashed potatoes, rice pilaf or just rice (any rice you enjoy cooking or have on hand), pasta, and polenta. We use a boxed rice pilaf with additional mushrooms, since that works for us, or polenta is another good choice. Ok, lets look at some photos shall we? 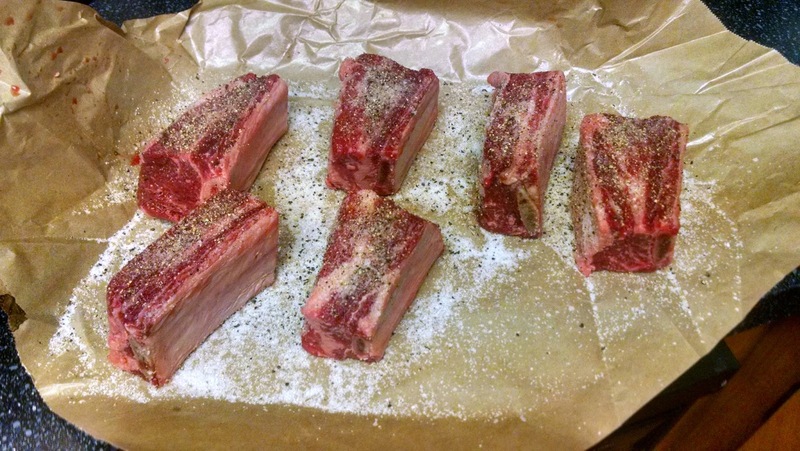 Ok, these are seasoned short ribs. About two hours before you are ready to go, get these out of the fridge and let them come to room temperature. This will help them cook more evenly. Most important, season AGGRESSIVELY. Add more salt than you think you need. Why you ask? This is a dense piece of meat and it needs a lot of salt to penetrate into the meat as it cooks. Second, you will lose a lot of seasoning as you move them from paper to cooking vessel. Same goes with ground pepper, use more than you think you need. I highly recommend fresh ground pepper. Don’t use the stuff that has been hiding in your cupboard for the last 8 months. There is no flavor in that for the maximum impact. Remember in my first post where I said you need patience? This is why! 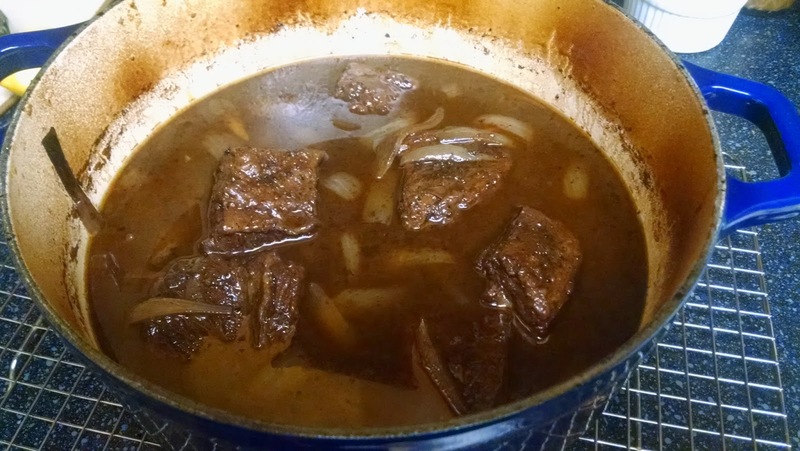 Although painstaking, getting this dark caramelized color will take your short ribs to the next level. The application is simple, but the execution is a pain. When you put the short ribs down, leave them alone and don’t touch them. You will want to give these as much time as you can before you try to poke, prod, or turn them to the next side. The more color, the more flavor. This is a good time to work on prep or make sure your beverage stays topped off. 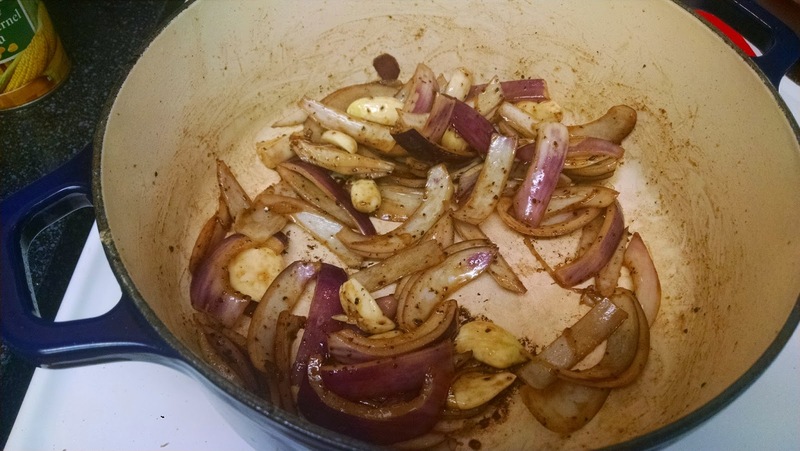 Ok, so after all your short ribs are browned, then you add the red onion and garlic to your dutch oven. We love garlic, so I have about 10 cloves instead of 4. Adjust to your level of comfort for garlic accordingly. 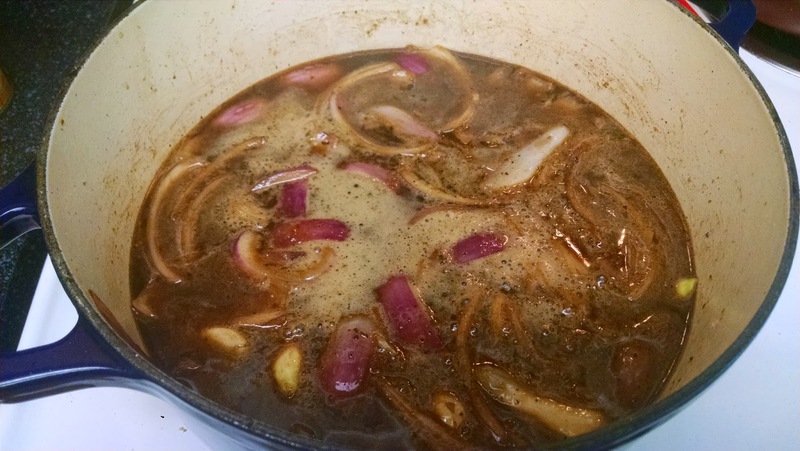 Now all the braising liquid has been added to the onions and garlic. If you have bits of food stuck to the bottom of your cooking vessel, don’t worry. This is flavor and you want it. Take a wooden spoon and try to scrape all that goodness off the bottom. Do what you can, it is worth it. Short ribs are nestled in and ready to go in the oven. Cover this with foil before you put the lid on. 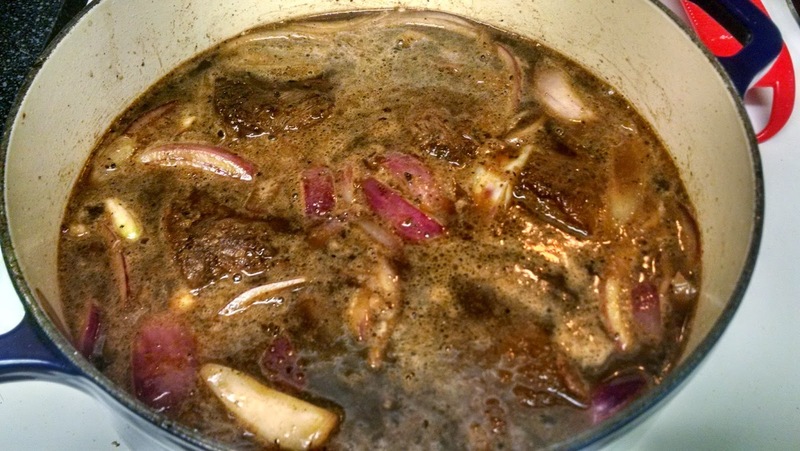 This steam will help the short ribs cook and become tender. After 3 hours and maybe another beverage, you have arrived where the blog started. That is your finished product. 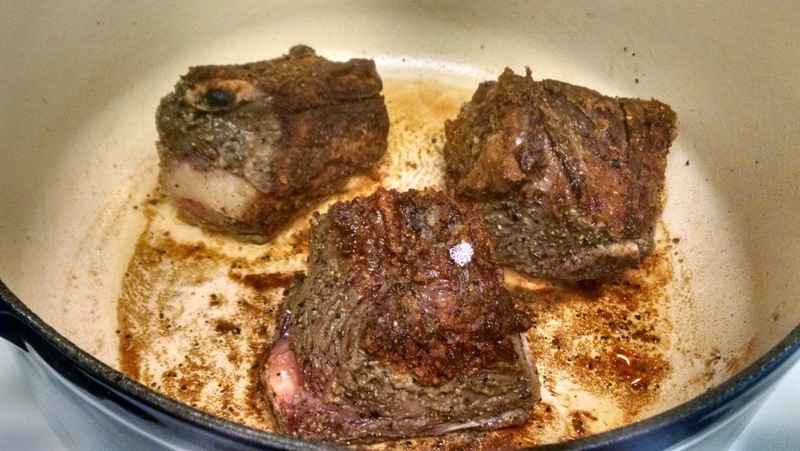 The short ribs will stay warm for some time after they come out of the oven. So, if you are still working on your sides that is perfectly ok. 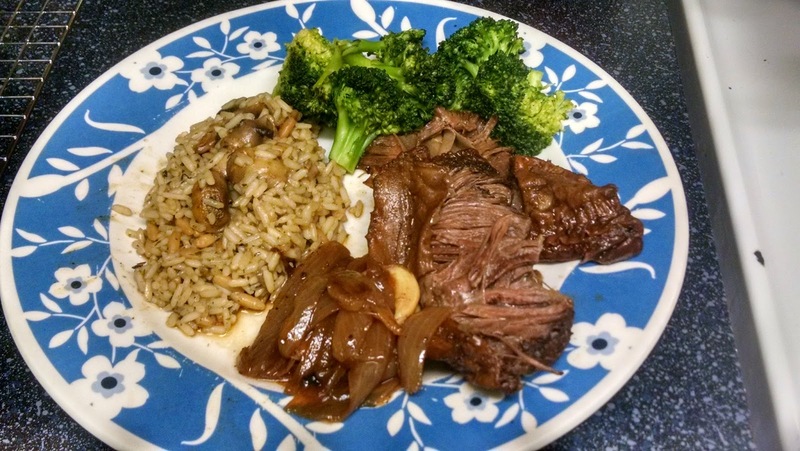 Here we have the finished dish, rice pilaf with mushrooms, broccoli, and of course, our fabulous short ribs.